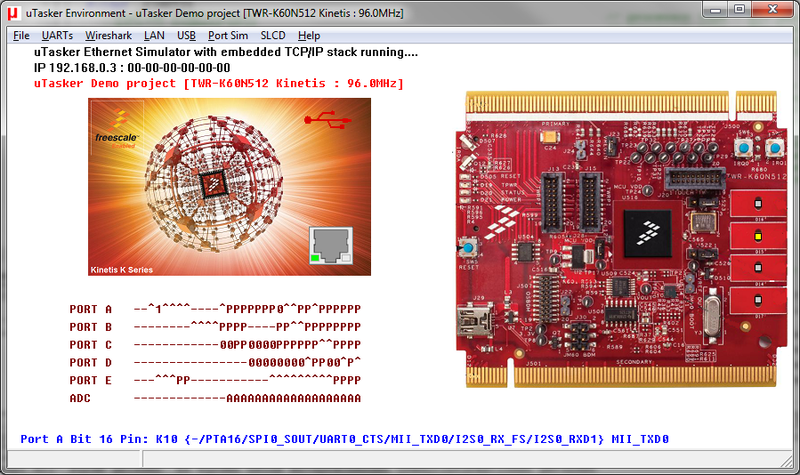 ...it were so easy and efficient to develop embedded Ethernet/Internet/USB projects. Kick-Start your Freescale Kinetis project at the Kinetis landing-page !! Kick-Start your Freescale Coldfire V2 project at the M522XX landing-page !! Kick-Start your ST-Micro STM32 project at the STM32 landing-page !! But why just imagine when it already can be so? The µTasker is the key. Its easy to use, fully supported and enables you to get your own project up and running faster than you thought possible. With 'out-of-the-box' complete project support even developers new to Ethernet/Internet and USB technology can get a project up and running in an afternoon. The µTasker is an operating system with TCP/IP stack and USB support as well as drivers for various Internet/USB enabled single-chip microcontrollers. It has its own unique device simulator allowing large parts of, when not complete, projects to be developed and tested on a PC. The simulated device is contactable by other PCs or devices on the network, enabling the most efficient embedded development environment imaginable. So why imagine? The µTasker can also be your key to success. Small footprint - The µTasker solution is especially suited to projects where an easy to use, slim-line operating system and TCP/IP and/or USB stack are of importance. This makes it ideal for single chip applications where the control of resources is critical but a high level of developer/user comfort can't be compromised. µTasker operating system - efficient and easy to use operating system to enable very modular and manageable software. Inter-task queues with flexible timer support. Supports distributed processing features over an integrated fast Ethernet network protocol. Including option to operate together with FreeRTOS for perfect combination of pre-emptive and co-operative characteristics. µFileSystem and µParameterSystem - Highly efficient internal or SPI FLASH based file system support, optimised for typical embedded applications. µtFAT - FAT12/16/32 compatible file system with SD card interface support, optionally integrated into FTP and HTTP servers supporting LFN (long file names) and optional data caching. Operates in internal Flash, NAND Flash, SD cards, external SPI Flash and/or USB memory sticks*. User Files support - Allows embedded files in code to be used or mixed with µFileSystem files, including utility for creating an embedded set of user files for simple upload to targets. Device drivers - UARTs (interrupt, DMA, RS485), I2C, CAN, character LCD, graphical LCD and TFT, Matrix keyboard, ADC, DAC, RTC, PWM, HW timers, port interrupts, etc. USB device/host*/OTG* support - CDC, RNDIS, Audio, MSD, HMI classes, user friendly configuration and interfacing, with buffered streaming mode as well as firmware upload capability. Special support - DMA library routines (Kinetis, M5223X - uMemcpy, uMemset), Low power task, Time management (RTC, time zones, daylight saving). TCP/IP stack - ARP, RARP, ICMP, IPv4/IPv6, UDP, DHCP, DNS, TFTP, TCP, dynamic HTTP, HTTP post, FTP server, FTP client, MQTT client**, SNMP V1/V2c, multicast with IGMP V1/V2, SNTP, SMTP, POP3, TELNET, NetBIOS and VLAN plus various useful utilities for real-world Internet work. Multiple interface, network (dual-homed) and VLAN capable. RNDIS operation over USB and PPP/Slip over serial. Integrated with the µTasker operating system for optimal performance. Secure Socket Layer** - Turn-key TLSv1.2 secure socket operation for MQTTS. DSP - Popular Digital Signal Processing functions integrated. Cryptography - Popular Cryptographic functions integrated. Graphical LCD support - µGLCDLib and graphical LCD simulator. Non-blocking FTDI FT800 graphical controller support with integrated emulation. Boot Loader - The µTasker project has integrated support for the "Bare-Minimum" boot loader which enables complete and secure software uploads via Ethernet/Internet (FTP and HTTP POST) as well as USB, and occupies less than 2k of FLASH space! Optionally it allows uploads to external SPI FLASH as well as encryption (less than 4k of Flash space). Serial Boot Loader - The µTasker project includes a stand-alone boot loader allowing deleting and loading new applications over a UART, from an SD-card or a memory stick*, as USB-MSD device, USB-HID or via web server. Unique µTasker simulator - allows the supported devices and peripherals to be simulated in "real-time" on the PC which can dramatically reduce development times compared to classical development/debug methods on the target. Ready-to-run with pre-configured projects - The µTasker project is delivered with setups for GCC make file building, IAR, Keil uVision, Rowley CrossWorks, CodeWarrior, MCUXpresso, Kinetis Design Studio (KDS), CooCox CoIDE, Atollic, Green Hills and Atmel Studio 6*. The µTasker project is a high quality framework designed for immediate used as base for professional work. * Some features are restricted to certain processor packages. Development system support is restricted in some cases to devices from certain chip manufacturers. ** Highlights newest features added in 2019. Please contact us for latest information or advice on choosing the most suitable processor and tools for your project. MODBUS - The µTasker MODBUS extension is a drop-in software module which adds flexible MODBUS functionality to your project. Get full details of the µTasker MODBUS module here. The µTasker project is a project/product of the company M.J.Butcher Consulting, located in Switzerland. Further details can be found at the web site of M.J.Butcher Consulting. For a brief history of the µTasker project please see this page. Welcome to the homepage of the µTasker operating system with integrated TCP/IP and USB stacks with target device simulator.